I'm so excited to be a part of the ESAD Autumn/Winter Mini Blog Hop today. You may have arrived here from the lovely Libby Dyson's blog. There's so many gorgeous goodies in this Mini Catalogue it's sure to please everyone. 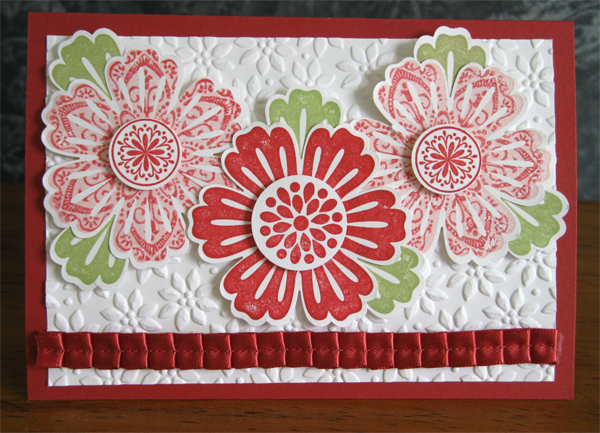 I came up with a couple of cards using the Mixed Bunch stamp set and the matching Blossom Punch. I used the "Kissing" technique to create the pattern on the flowers. This stamp set contains 3 different images of the flowers, one is a more solid image, one is a delicate pattern, and the other looks like daisy petals. Ink up the solid image in a light coloured ink, ink up the patterned image in a dark coloured ink, then "kiss" the rubber stamps together (put the solid image to the pattern), and then stamp onto Whisper White cardstock. Punch out with the Blossom punch, and there you go. The colours I used are: Concord Crush and Wisteria Wonder (for the top left flower), Island Indigo and Pool Party (for the top right flower), and Concord Crush and Pool Party for the middle flower. The leaves are another flower stamped using the solid image and Pear Pizzazz ink. The centres of the flowers are another stamp in the same set, which are then punched out with the 3/4" Circle punch. The card base is Concord Crush, and I've put a Whisper White panel which has been embossed using the Perfect Polka Dots Textured Impressions Embossing Folder. My second card uses the same technique, but here I've used different colours for the flowers (Riding Hood Red and Blushing Bride), and the Petals-A-Plenty Textured Impressions Embossing Folder. I've also added a strip of the new 3/8" Pleated Satin Ribbon in Riding Hood Red to add a finishing touch. The flower centre on the bold red flower is also in the same stamp set, and this one is punched out with the 1" Circle punch. 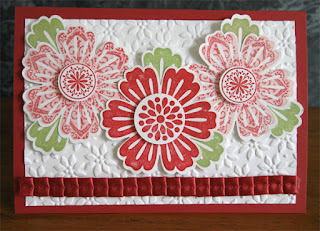 On both cards the flowers are raised on the card base with Stampin Dimensionals. I used Mini Glue Dots to attach the ribbon. I hope you like my cards, and I hope you enjoy the blog hop! Now it's time for you to move on to Kelly Nelson's blog. Love this kissing technique with the flowers Tina. Must try that!! Lovely cards, fun technique & great ideas - thanks for sharing. That Mixed Bunch set popping up again I love it, thank you for sharing with us all today well done. Oh wow these are just gorgeous. Love them. Great idea! Love the way this technique worked on the flowers. Great kissing cards! The technique really adds a unique spin to the stamped flowers. Sherylee. beautiful Tina, I love this set. Well Im just gonna have to put that stamp set on my wishlist now! Thanks for the beautiful inspiration! fantastic way to use kissing, Tina & I love the layouts & colours your used. Beautiful. Gorgeous projects Tina. 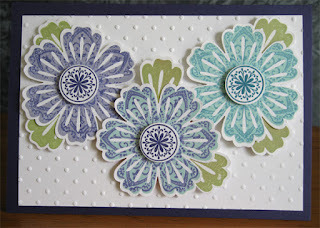 Some inspiration for after I've ordered my mixed blossoms stamp set. oh what a neat idea!! never would of thought of the kissing for these stmaps! Love it Tina, the Kissing Technique works really well for these stamps. I'm also loving my Mixed Bunch stamp set & punch - but now I'm off to trying kissing! The colour combo are beautiful. Thanks so much for sharing! Pucker up! Lovely cards and didnt know that this technique was called "kissing". I havent done this for such a long time and the stamps do loan themselves to this technique really well.